Today is Shakespeare’s Birthday – as well as the day he died – April 23rd. So in honor of the Bard I’m including a few of his food and wine quotations at the end of this piece. For the actual cake I went to my tried and trusted favorite flourless chocolate cake recipe and made up two large slabs. These were sandwiched together with whipped cream scattered with strawberries and raspberries. For the frosting on top – much needed because the top cake cracked as I was placing it – shhh my little secret! – I used a basic buttercream recipe with lots of vanilla. Personally this was way too sweet for me and if I were to do it again I would probably have added orange zest and flavor – but I was nervous this would make the frosting break and this was no time to start experimenting and making mistakes. We were already running late for the party and I was hungry for some fried chicken! The party was a huge success – with the food provided by the Ludotruck – oh yes we all got to eat some of that wonderful Ludo fried chicken. On the drive to the party Rémy wasn’t sure he wanted fried chicken – “But Ludo is famous for his fried chicken!” explained Minty. 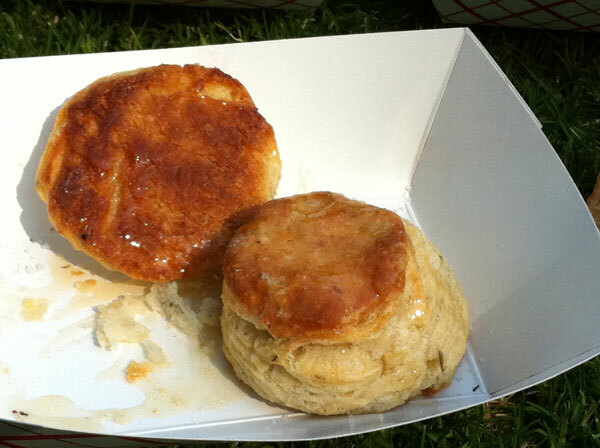 For my birthday I want lavender biscuits for my cake – seriously. Makes one slab cake – you need two – I made up two cakes, one after the other – I find this is always much easier for the homecook than doubling the recipe up and getting into trouble with overfilled bowls and worse still an overflowing electric stand mixer! 1. Preheat the over to 350 F. Line a large shallow baking pan with parchment paper, let paper hang over the ends and sides. 2. Whisk the egg whites until you get soft peaks. Add half the sugar (1/2 cup) and beat until you get stiff silky peaks – take care not to over beat. Set aside. 3. Beat the egg yolks with remaining half of the sugar until thick and pale yellow, about 5 minutes. 2. Sift the powdered sugar and slowly add to the butter. 4. Spread across the top of the cake in a thin layer. 5. Mix some of the black fondant with the dark brown fondant to get a rich dark brown color and roll out to a thickness of about 1/8th of an inch. 6. Print out the monkeys and cut each one out to use as templates. 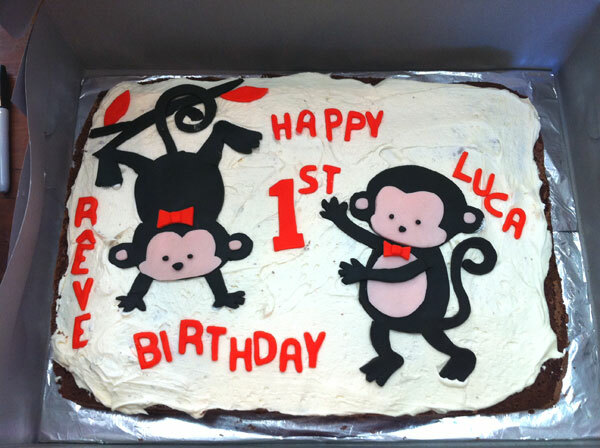 Place the monkey template on top of the rolled out fondant and with a sharp pointed knife cut out. Do the same for the face and belly with the natural pink fondant. Gentle remove the paper template and place the face and belly in place. Add eyes, nose and ears and the arm across the top of the pink tummy. 7. Roll out the orange fondant and cut out the HAPPY BIRTHDAY and the names. Using the small sharp knife cut out two bows – one for the hair and one as a bow tie and place on the monkeys. Finally cut out a branch from the dark brown fondant and then two orange leaves. 8. 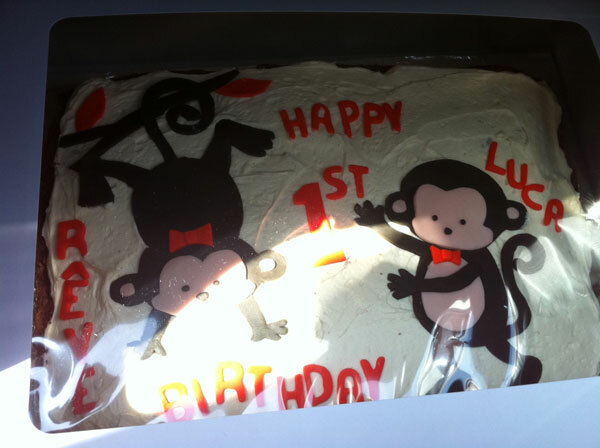 Carefully place the monkeys and letters on the cake. And back to that other birthday being celebrated today – Shakespeare – I hope these quotations inspire you – to chop onions, eat pastries with dates and quinces, eat less beef (bad for the wit), refrain from garlic breath, eat wild roasted boar for breakfast, lick your fingers or use wine well… cheers! My lord of Ely, when I was last in Holborn I saw good strawberries in your garden there; I do beseech you send for some of them. No more words: Away! Go, away! He hath eaten me out of house and home; he hath put all my substance into that fat belly of his. 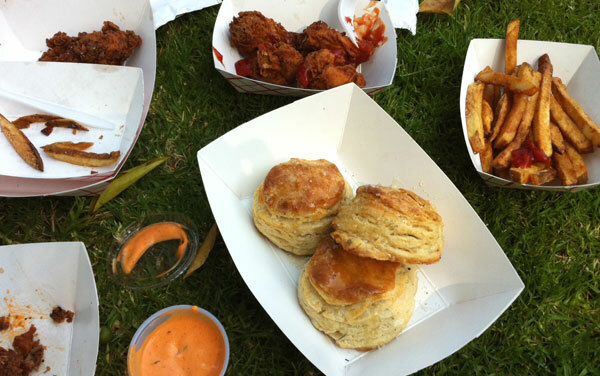 Love those biscuits and chicken. The cake is too cute. What a fun event – such a clever way to make a birthday extra special!